© FAUX NEUX COPYRIGHT 2016. ALL RIGHT RESEARVED. OWNED BY LIONEL BACHMAN. Venturing into the world of FAUX NEUZ is easy. 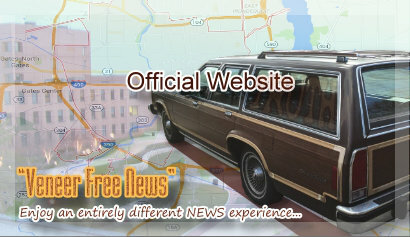 Using your favorite devices you can start your search for true news. After joining FAUX NEUZ, brouse your favorite websites - like CNN, Fox News, MSNBC, Wall Street Journel, New York Post and thousands of others* - to add your own ‘custom story title’ using FAUX NEUZ. 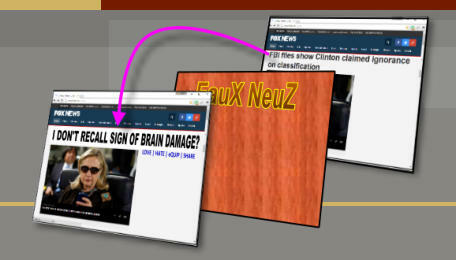 With FAUX NEUZ you can change the title of any story, and then share and rate the best and worst ‘custom story titles’. You also have the choice of viewing the original story title, your ‘custom story title’, or the highest/lowest rated ‘custom story title’ submitted by other FAUX NEUZ users. Please note, the lowest rated ‘custom story title’ provides an ‘atlernate view’. Creating and adding your ‘custom story title’ is as easy as using the FAUX NEUZ controls that automatically appear when you visit your favorite news website. Controls allow FAUX NEUZ users not only add ‘custom story titles’, but also view and rate other’s ‘custom story titles’, change viewing options and notifications, as well as share ‘custom story title’ using FACEBOOK, Twitter, SnapChat or other social media platforms. ** Even Better, generic demographic information collected when a FAUX NEUZ account is setup is available for populate titles. There are three ways to rate FAUX NEUZ ‘custom story titles’ - 1.) Rate the ‘custom story title’ automatically presented when you visit your favorite website, 2.) Rate FAUX NEUZ ‘custom story titles’ that are automatically sent to you based on the delivery options selected, or 3.) Rate the ‘custom story titles’ on FAUX NEUZ’s website. 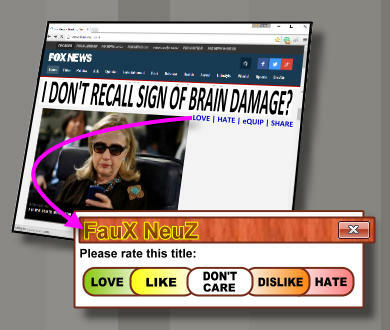 FAUX NEUZ rating using the following five variable - Love, Like, Don’t Care, Dislike, and Hate. These ratings are then used to determine the highest and lowest ‘custom story titles’ for your generic demographic profile. 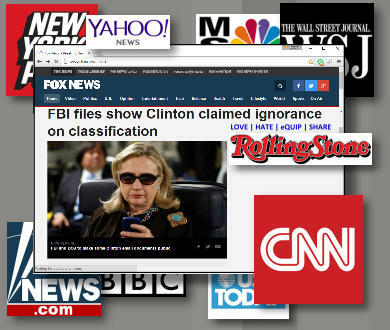 * CNN, Fox News, MSNBC, Wall Street Journel, New York Post and any other website mentioned here are not owned or affilitaed with FAUX NEUZ. 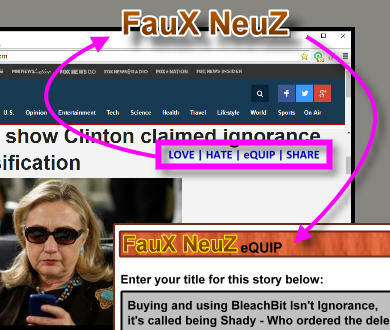 Getting the real story, or at least an accurate story title, is what FAUX NEUZ is all about. Based on your profile and delivery options selected, you could have FAUX NEUZ automatically presented when you visit your favorite website with you ‘custom story title’, the highest/lowest rated ‘custom story title’, or a rotation of the different title options. 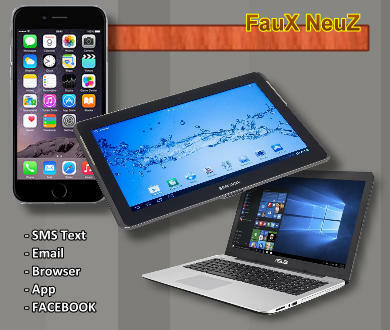 FAUX NEUZ deliver options also include email, text (SMS) or message your social media (FACEBOOK, Twitter, SnapChat or etc. **) account. ** FACEBOOK, Twitter, SnapChat or other social media platforms are not owned or affilitaed with FAUX NEUZ. Ipsum eiusmod voluptate cupidatat tempor eu in aliqua. Id voluptate, in veniam, ut duis veniam ex in tempor, ullamco eu cupidatat voluptate dolore, et officia dolore? Dolore consectetur lorem velit, adipisicing dolore nulla occaecat deserunt sed? Minim nostrud consectetur culpa commodo nulla ut occaecat eiusmod eu amet dolore sunt mollit voluptate labore quis: In, ad, excepteur voluptate, fugiat nostrud, aliquip enim. Nostrud do, et duis ut officia, esse occaecat nulla aliqua esse id occaecat deserunt eu consectetur. Laboris adipisicing aute, esse, elit ullamco occaecat sint aute in, exercitation nisi anim, cillum excepteur mollit.